Harvard Kennedy School DC Alumni Council has organized a volunteer opportunity with Wreaths Across America, placing a remembrance wreath on every veteran's grave at Arlington Cemetery on Saturday, December 15th. 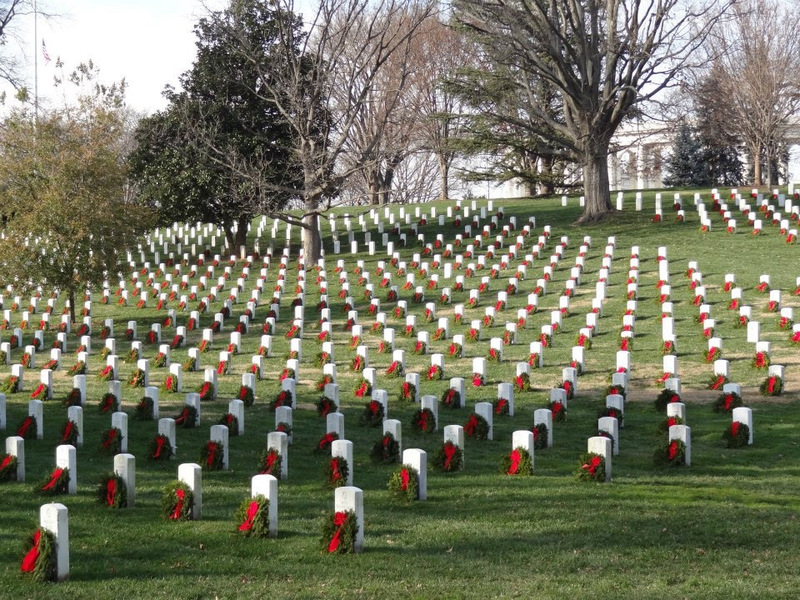 In 2017, more than 1.5 million wreaths were placed on veteran headstones at 1,422 participating cemeteries around the country in honor of the service and sacrifices made for our freedoms, with each name said out loud. Come support the wreath-making Worcester family's vision of remembering fallen U.S. veterans, honoring those who serve, and teaching the value of freedom. Volunteers are advised to dress warmly (warm socks and shoes especially) and wear gloves as you’ll be handling needles and sap. We will meet and gather at 8:00 am. Cemetery gates will open at 8:00 am and all volunteers will have to pass through security screening. There will be a brief opening ceremony at the McClellan Arch within the cemetery grounds, and wreath-laying itself will begin at 9:00 am. The wreath-laying is held rain or shine, as it is a rare day with no scheduled funerals. The wreath-laying will complete when all the wreaths are placed, about 11:00 am. Participants should expect to gather a wreath from a truck (and possibly wait a little to do so) then take the wreath to a grave, say the name of the grave occupant in commemoration of their life and sacrifice, then return to the truck for another wreath with which to repeat the process. Metro is recommended, given the anticipated crowds and car traffic: The “Arlington National Cemetery Station” is located on the Metropolitan Washington D.C. Area Metrorail's Blue Line. There is also a Metrobus stop on Memorial Avenue. Information on the hours of operation, schedules and fares for the Metrorail and Metrobus are available on the WMATA website. The Cemetery garage will be closed to the public except for handicap permits. General public parking is available at the North Parking Lot of the Pentagon where there will be Metro Shuttle buses to take volunteers to the Cemetery's South Gate for screening and entry to the grounds. There are also Shutttle buses from the Rosslyn Metro to the Old Weitzel entrance gate. It may be a long time for some to go without food/water – so you are encouraged to bring a granola bar. Other types of food are discouraged given the memorial nature of the Cemetery and the risk of refuse left behind. Please join us at the Sine Irish Pub in Pentagon City at the conclusion of the wreath laying to warm up and get to know each other better! We have a reservation there at 11:00 am. Please contact communityservice@harvard-dc.org with any additional questions. Click the button below to register on the HKS website.